It appears those rascally rabbits from The Playback Collective have gone and turned one of the best horror films of 2015 into a 1980's Italian horror export. And that's fine by us! The retro VHS cover is accompanied by a wonderfully old-school trailer complete with tacked on voice over straight out of the era. 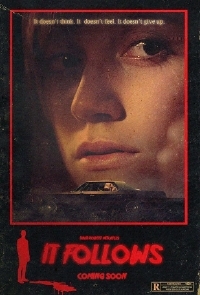 What if Lucio Fulci had gotten a hold of the script for "It Follows"? Wouldn't that been awesome? So I headed back to my Brooke Shields poster filled room not listening to what mom and dad had to say about me watching THOSE horror movies, warning me once again not to listen to Whitesnake, of course I didn't listen. I blasted my stereo, turned on my 1981 IBM PC and did my best create something totally rad that people would enjoy. Paying homage to the greatest 80's horror trailers out there this quick cut will make your blood run cold!